The book is finished, so let’s talk about it as a whole. OK, let’s do it. Finish is in sight. Last time, lots of setup, not much events. Now, mindfuck. We are over halfway through the book, so it’s time for some thoughts about how the story can be improved. Last time, cannibalism. Now, aftermath. Last time, all of the exposition, all of it. Now, sloppy teenage make-outs. Thankfully interrupted. Last time, plot happened. Now, exposition, lots of it. Last time, lots of stalling. Four chapters in a row set during the secret hour. I feel the plot is finally upon us, thus making the unnecessary stalling just barely tolerable instead of infuriating. Let’s see how it goes. Last time we met local SEES. This time I should see if I can make a DRYH reference instead. OK, people and assorted beings, let’s do it. 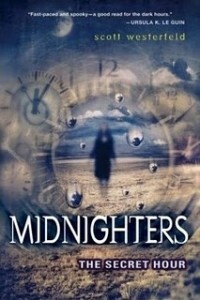 I remember the Midnighters trilogy fondly, but I’ve read it a long time ago, back when I was actually buying those things called “paper books,” and my former self had a terrible taste in literature. Let’s see how the book holds up to my nostalgia. I do recall there being some world-building problems, so there certainly would be something to talk about, but I am curious if there is some more problematic stuff to be found and if the plot would look any good to me now.